This week, I want to talk about creating a mood for your army. It's one of those things you feel when you look at an army standing there on the table. They just look like they belong somewhere in a distant world or that they really do fit the background we know about them. When I came across this Legion of the Damned trooper post by The Lair of the Breviks talking about his epic OSL fail, the first thing that struck me was the amazing mood he created with the color scheme. Did he fail at the OSL application, yes he did... but he succeeded elsewhere. Do you know what he did do that so many people struggle to create? He created an absolutely great mood for this guy. The dark armour, the glowing runes and eyes... the high contrast between the few bone areas, metals and the dark blue of the armour. The muted and simple base to set the model off. Did he hit all the technical benchmarks? Nope. 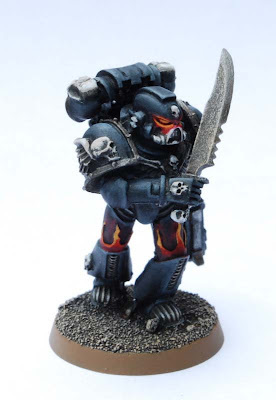 Did he come away with a great looking mini? Absolutelly. Sometimes it's ok to not get it all perfect. It's ok to mess something up or not do it as well as others do. It's not always technical skill that makes an army look great on the table. Does it help, sure, but there's more to it than that. Creating a mood for your own army can be done any number of ways from basing to a unique painting style, palette choice, this list goes on. Don't get caught up in the technical aspects all the time... sometimes it's better to do it so it looks good and not worry about how it would be in the "real world." I completely agree. I'd rather play an army that has a great feel to it and interest over an army that's painted to technical perfection but lacks emotion. Glad you spotted this in the roles, I thought the same. Great scheme, another great alternative to the happy clappy GW style for these supposedly dark and mysterious warriors. Some good food for thought. I've been thinking this myself with my Blood Ravens. I've been swapping my Sergeants for Neophyte models from the Dark Angels but the mood of my army still feels too...'normal'. Siph_Horridus: Glad to hear you're still on track. Thor: Don't get me wrong, technical skill is nice, but a gorgeous "looking" army can be so much more appealing sometimes regardless of the skill level. TO some degree they go hand in hand, it's knowing when to stray from the technical accuracy though that can matter. Crosser Modelling: I thought it was worth posting to share and highlight the fact that while it's not technically the "best," it does far better at accomplishing something else. ServvsUmbrarum: That's part of finding the look/feel of your army... doing some experimenting to see what stands out to you. The best thing you said, "Sometimes it's ok to not get it all perfect." People need to realize that more often. Perfection is an ideal, and not something achievable (in my opinion). Great article! Also remember that if you don't try new things, how will you ever get any good? It's ok not to be great at once, as long as you don't try to please anyone else and paint for your own enjoyment. The rest of the squad is all over the place looks-wise (as I've been experimenting to find a good look for them), and I'll be doing my best to fix them to look like this chap, but as a side project while I work on other stuff. Flekkzo: Well put, it's the attempt and what you discover in the process that matters. If you don't enjoy doing it, what's the point? Andy: Thanks for letting me share this with everyone and I hope you get the squad all together and keep the mood you've created.